The applications on your network directly support your business activities. All of your other IT resources are there to provide services to the applications. So, keeping your business running relies entirely on the performance of your applications, but keeping that software performing well also requires you to monitor the underlying services and your hardware. Application Performance Management (APM) is the top layer of your support tasks. If applications seem to be performing badly, you need to rule out any problems with the software before checking out server performance, and then, network equipment. Application software needs to be kept up-to-date and virus free in order to function correctly. SolarWinds Server & Application Monitor (FREE TRIAL) – This tool that runs on Windows Server combines both application and server monitoring. 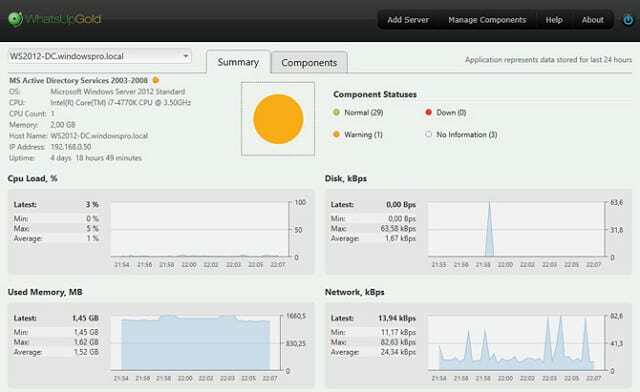 SolarWinds AppOptics Application Monitoring (FREE TRIAL) – A Cloud-based service that focuses on application performance issues. 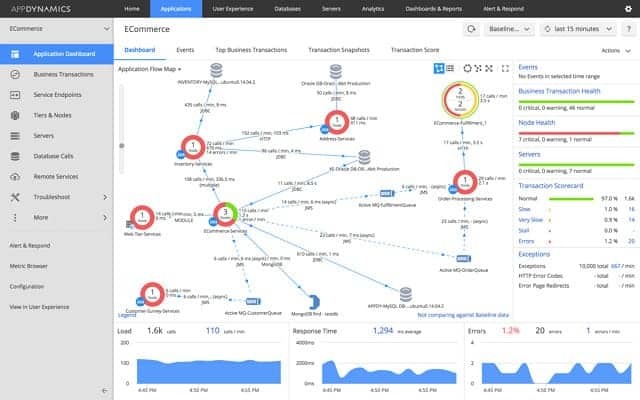 AppDynamics – This monitor includes an application stack map so you can instantly see which underlying resource is causing application performance problems. New Relic APM – This applications monitor analyzes events by inspecting the performance of code written in the seven most frequently-used languages for online services: Java, Node.js, PHP, .NET, Python, Ruby, and Go. 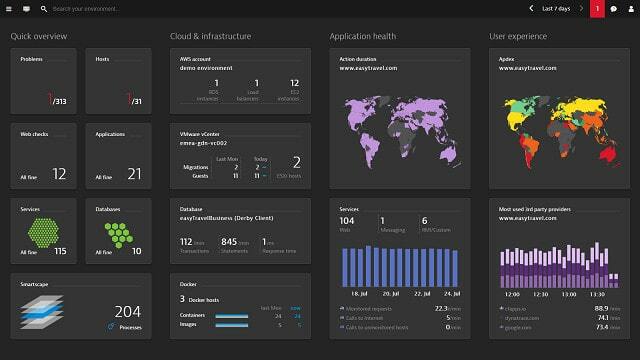 Dynatrace Application Performance Management – An online service that specializes in monitoring apps for Cloud-based businesses. 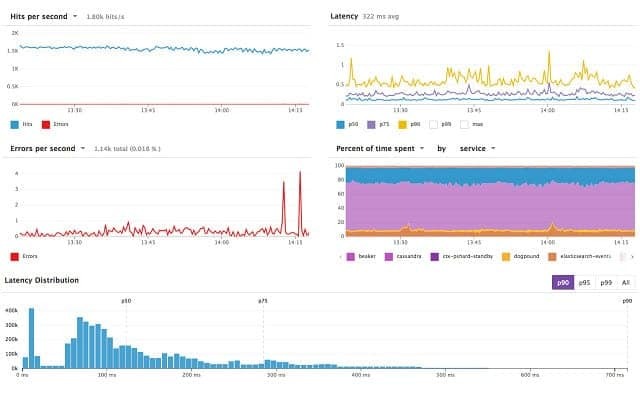 Splunk IT Service Intelligence – This tool includes an AI module that produces predictive reports that show you where capacity problems may be likely to occur. WhatsUp Gold with Application Monitoring Add-on – The core WhatsUp Gold monitors networks and you can extend it with an add on to track application performance. CA Application Performance Management – This bundle of tools includes Application Performance Monitoring, App Experience Analytics, and Synthetic Monitoring. AppEnsure – This tool is aimed at providers on online server; it monitors both user experience on a website and application delivery statistics. Datadog APM – Cloud-based monitoring for infrastructure, applications, and event logs. There are too many factors that could impair software performance for you to keep on top of all of them unassisted. Application performance management tools will allow you to keep the system running and head off disasters. With proper application management, you can prevent problems that cause users to make Help Desk calls. So, this software pays for itself because it will save your IT department time and money on customer support functions. The options open to you include on-premises software, cloud-based application performance monitoring software, services that you pay for by subscription, and software packages that you buy outright. Your choice of application performance management tool will depend on your IT support strategy – whether you run all your services in-house or prefer off-site solutions. The size of your organization and your IT budget will also be major factors. 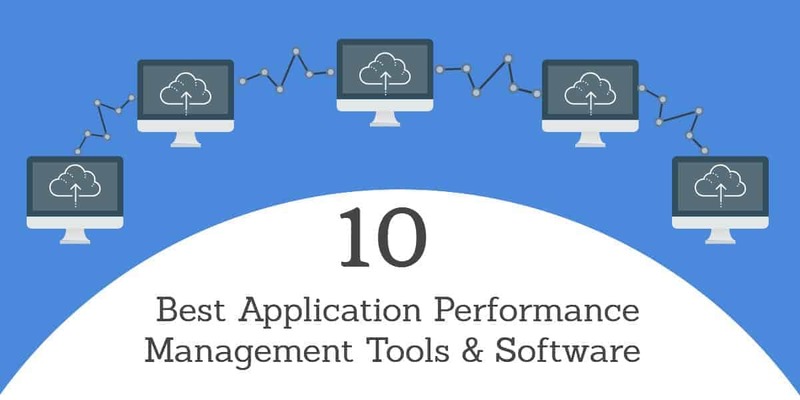 So, when you read through this list, you will need to keep your own circumstances in mind in order to identify the applications performance management software that is right for you. If your IT department supports a large organization, you will need an application manager that integrates with other infrastructure monitoring modules. SolarWinds provides a suite of infrastructure support tools that are all written on the same platform. These tools all share data, so the more of them you implement, the better the insight you will get into the performance of your applications and all of the services that support them. The performance of applications is very closely tied to the performance of the hosts that the software runs on, so it is a very good idea to get a management tool that combines both application and server monitoring and that is what this software provides. The servers that you include in your management environment can be spread across several sites, and the tool will also monitor Cloud servers operated by Azure or AWS. The monitors and displays of the dashboard don’t rely on a „one size fits“ all strategy. The software adapts to show critical information that relates to each application, so you will see different metrics for a database management application from what you would for a web server. This adaptability is driven by a series of templates. The Server and Application Monitor includes more than 1,200 templates that cover all of the major applications that are available on the market today. The server monitoring element of this software extends to the statuses of storage server, which may be on premises or in the cloud. You can extend the depth of information gathered by this module by adding on the SolarWinds Storage Resource Monitor. A great feature of this tool is the AppStack module. This gives you a visual representation of the applications that are running on your system, with all of the support layers of services and hardware shown in a stack below each. So, you can see the status of the application, the metrics for the server that it runs on and, if you are operating a virtual environment, all of the servers and networks that underlie that virtual machine. This is particularly useful if you operate applications on Cloud or remote servers because it helps you see within an instant where underlying services are dragging your application performance down. SolarWinds sells a perpetual license to this software, so once you pay for it, it is yours forever. However, the price only includes the first year of support and updates for the tool, so you will have to pay for support in subsequent years. This software is only available to load on the Windows Server environment. The monitor installs in minutes and it will discover all of your applications and server statuses itself automatically. If you also buy the SolarWinds Network Performance Monitor and the SolarWinds NetFlow Traffic Analyzer, you will be immediately in control of all of the factors that could cause your business’s applications to fail or perform badly. The Server and Application Monitor can be bought individually, or in the Systems Management Bundle. This pack also includes the company’s Virtualization Manager, the Storage Resource Monitor, and the Web Performance Monitor. Another bundle offered by SolarWinds combines the Server and Application Monitor with the Database Performance Analyzer. This grouping is called the Applications Performance Optimization Pack and is a particularly good buy if your business is heavily dependent on an ERP system. Whether you choose the Server and Application Monitor on its own, with a combination of other SolarWinds tools, or as part of a bundle, you can get the software on a 30-day free trial. AppOptics is a new offering from SolarWinds. It is a cloud-based solution and, unlike the Application Performance Monitor, is set up on a subscription basis. The company offers two levels of service for AppOptics. The cheaper plan covers infrastructure monitoring, but not application management. 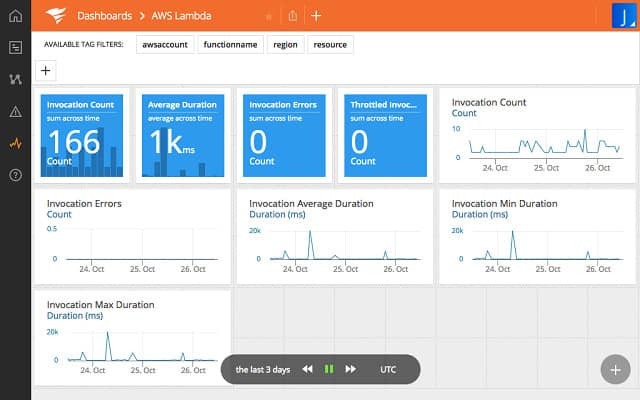 This plan covers server and network monitoring, AWS Cloudwatch integration, and the storage of historical data. The higher-priced plan adds on application performance monitoring and application delivery tracing. The applications management aspect of the higher-priced plan covers both traditionally-hosted applications and distributed systems, which may deliver applications across sites or from the Cloud. The tracing capabilities of the system show you the resources that application communications pass through on their journey from the server to the endpoint. This will enable you to spot bottlenecks in the network path and give you the ability to move or add on resources to optimize delivery times. The dashboard is able to show application, server, and infrastructure metrics on the same screen. This will enable you to see whether underlying services are the cause of application performance problems. Facilities in the dashboard include analytical tools that enable you to combine metrics, set ratios, and thresholds for your own customized triggers and assessments. The data analyzer includes a query language that allows ad-hoc queries for you to make quick explorations of the data arising from the monitor. Graphical features in the dashboard give you the capability to overlay series of time-shift data to compare the performance of your applications over time. Although AppOptics is a cloud-based service, the APIs that collect data from your system can’t be installed on just any operating system. The service can interact with Windows Server and Linux environments. You can get a 14-day free trial of SolarWinds AppOptics. AppDynamics started as an independent company, but it is now owned by Cisco Systems. The involvement of this networking giant should see this monitoring system evolve into an industry leader, so this is one to watch. The dashboard for the service is very busy and it focuses on your applications and the services that support them. Another view of performance data follows user cases to show the speed of delivery and the demand for different services and applications from your enterprise. As there are almost no infrastructure metrics in this tool, you would probably choose AppDynamics for online businesses that are entirely provided by Cloud services. The application stack map, shown in the illustration above explains the performance of all of the apps that are active on your system in a real time display. The services that support those applications are also included and problems highlighted in those supporting systems may highlight status issues. These issues, with the underlying infrastructure, would need to be investigated with a separate monitoring package. The software monitors your application software in real time and builds up historical data, which enables it to create a baseline of standard performance. This alone might prompt you into making changes in your capacity provision if it displays poor performance. If everything looks good in the baseline, you can progress to the diagnostic tool to see whether the applications perform well around the clock. You will be able to identify which applications are likely to run into trouble in times of high demand. The user experience module of the tool lets you see where all the demand for your services comes from and which products and services are the most popular. This is a great tool for business analysis as well as application performance monitoring. AppDynamics is available in a free version, called AppDynamics Lite and there is also a paid version, which is available on a 15-day free trial. The standard paid package is called APM Pro, but there are two higher packages: APM Advanced, which adds on server and network metrics and APM Peak, which also includes marketing analysis functions. The service is provided on the Cloud by default, but you can request software to install on premises instead. If you go for the Cloud version, you still have to install some software. This is the App Server Agent and it can only be installed on 64-bit Linux and 64-bit Windows environments. New Relic produces a range of monitoring tools and the APM is one of those. The other modules available are New Relic Infrastructure, which observes the statuses of your underlying hardware and services, New Relic Browser, which helps online businesses track user experience, and New Relic Insights, which is an analysis module. The New Relic APM will work without any of these other modules. However, combining the APM with other modules will give you deeper knowledge of the causes of problems and help you improve your online service. 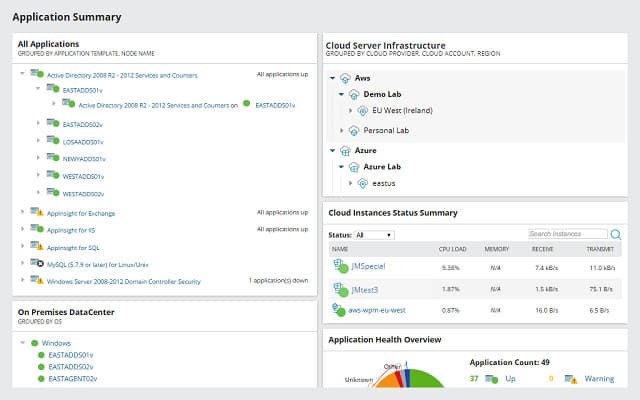 The New Relic system is an online service and if your infrastructure is also provided by Cloud services, the monitoring software will integrate directly with them. The monitor can be integrated into AWS, Google, Microsoft Azure, and Rackspace hosted servers. It can also integrate with your own on-premises servers. The service analyzes events by inspecting the performance of code written in the seven most frequently-used languages for online services: Java, Node.js, PHP, .NET, Python, Ruby, and Go. This means that it will also be able to trace the activities of your custom software, not just the well-known pre-written applications. The APM monitors all of your internet traffic including that originating from mobile apps. This service is tailored towards online businesses, such as information websites, and web stores. The tool is able to support the migration of applications from on-premises servers to Cloud services and it is also helpful when managing the release of new products or revamping existing web services. Both data transfers to the Cloud server of New Relic and data storage are covered by encryption and user authentication. The dashboard for the service includes a lot of graphics to help you identify problems and performance successes rapidly. The main information that you need is all there in the application monitoring display. You will see response times, throughput metrics and error rates both as figures and as time-sampled graphs. You can also track individual visitors journeys through your website as well as getting overviews of application performance. The interface includes database monitoring and you can search through collected data to analyze performance issues. The dashboard includes team collaboration features, such as information sharing and note making. You can customize the dashboard and create user groups, giving different team members access to different data views and controls. 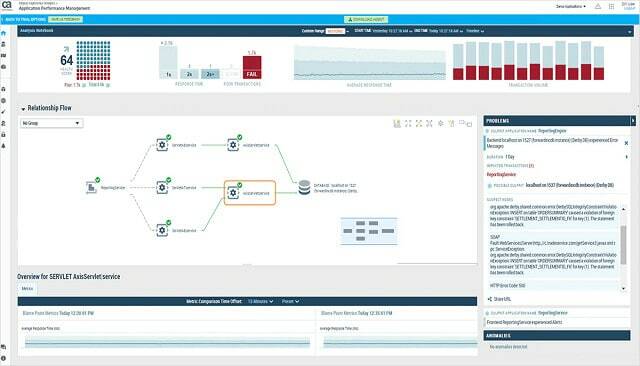 The New Relic APM can be integrated with help desk management systems. There are three plans available for New Relic APM. The Pro APM version is the top of the line and it is available on a 14-day free trial. A cut-down version, called APM Essentials lacks the analytical functions of the service. An important element of the Cloud service is its data retention period, which enables you to query performance over time and get analytical insights into your application delivery. If you are not as interested in this data retention, you can get APM Lite, which is a free version of APM essentials but with data held for only 24 hours. Dynatrace specializes in support software for Cloud-based systems and web enterprises. The software can be installed in-house, or you can access it on the Cloud. The pricing structure also gives you options; you can buy an annual license or buy the software outright. Even if you choose to use the system online, you still need to install an element. This is called OneAgent. This is the data collecting monitor that reports back to the analytical engine which may be on your server or operated remotely by Dynatrace. The OneAgent monitor installs on Windows Server, Windows, Linux, and Unix. If you choose to install the entire system in-house, you will need one of those operating systems to host it. The Dynatrace structure covers Cloud infrastructure with one package or applications, hosts and services for in-house systems with a different package. Apart from that division of service, the software isn’t sold as specialized modules, so you get infrastructure monitoring and user experience tracking with the application performance management system. The Dynatrace methodology observes your application performance from two angles. One aspect focuses on the mechanics of delivery and that reaches down into infrastructure performance as well as producing metrics on the throughput of application execution. The other viewpoint is user experience. The software logs each visitor and measures application usage and response times per session. The Dynatrace package also includes „synthetic monitoring.“ This is a planning tool that emulates the actions of users and can generate expected visitor volumes. This is useful for when you plan to add new pages and services to your website. The information you glean from these application tests can warn you of any need to increase infrastructure capacity and also help you optimize the location of the new pages in your website. Splunk applies artificial intelligence (AI) to its monitoring software. The company produces a range of monitoring tools including infrastructure management. However, the product you need to monitor your applications is called Splunk IT Service Intelligence. Although this is a separate product to the infrastructure monitoring package, it does include features that monitor events and hardware statuses so that you can get an insight into the causes of poor application performance. The AI element of the tool creates predictive reports that show you where capacity problems may be liable to occur. The tool also indicates peaks and troughs in demand and predict when the next surge in demand will occur. This will enable you to schedule batch jobs in quiet times and relieve the pressure on your infrastructure or buy extra capacity. If you already have an application monitoring tool, you can just opt for the add-on ITSI module for application performance. This will analyze the log files of your existing APM to focus on predictive capabilities. The tool also gathers information from your event logs to spot service delivery problems. 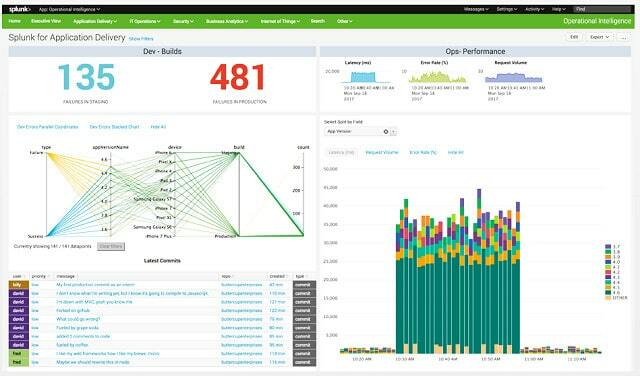 Splunk offers a 15-free trial of the Sandbox version of IT Service Intelligence. The package is an add-on to one of the main IT monitoring packages of Splunk, which will manage your infrastructure. The main package that the company offers is called Splunk Enterprise. If your business doesn’t have any on-premises infrastructure but is entirely supported by Cloud services, you should opt for Splunk Cloud. There is also a specialized package that will monitor AWS services. Splunk Enterprise is available on a 60-day free trial and you can get a 15-day free trial of Splunk Cloud. A cheaper version of Splunk, called Splunk Light has a limit of 200 GB of data per day and you can get it on a 30-day free trial. There is also a free version, which has a data limit of 500 MB per day. However, you can’t add on IT Service Intelligence to the free Splunk. Splunk Enterprise, Splunk Light, and Splunk Free are all implemented as on-premises software and Splunk Cloud is accessed online through a browser. The Splunk software can be installed on Windows, Linux, and Mac OS. WhatsUp Gold is an alternative to the SolarWinds Application Monitor solution if you want to go the route of integrating several infrastructure monitoring tools. With this option, the Application Performance Monitor is an add-on module to the core WhatsUp Gold package. The basic WhatsUp Gold plan gives you server monitoring and also network device management. With the Application Performance Monitor added onto those modules, you will get a system-wide overview that will help you identify underlying problems that could cause problems with the performance of your applications. The standard WhatsUp Gold software also includes storage monitoring and wifi and cloud-based services monitors. The network features of the tool create a map of your system so that you can identify which network devices pass traffic through to which others. This will help you see where bottlenecks impair the delivery of applications to individual areas of your enterprise. Higher package plans include the Network Traffic Analysis module and that can give you deep insight into network performance. The top WhatsUp Gold package includes Configuration Management for your network devices. The Application Performance Monitor add-on will log all of your applications during its set-up phase, which is automated. Once the monitor is in place, it will keep track of application performance in real time, displaying metrics in the dashboard and generating alerts when critical performance issues arise. Both alert conditions and the dashboard display are customizable. The Component Summary Dashboard in the tool shows you a view of a selected application and all of its supporting services. This facility lets you see instantly where application performance problems are really caused by issues in other areas of the system. The applications manager recognizes well-known applications, such as Apache, Hyper-V, and SQL Server and adapts its monitoring activities according to the application type. You can also set up the monitor to track lesser known applications and your own custom-built software. There are more conditions that the tool can monitor than could fit on one screen and so you can browse through the options in the tool in order to select which statuses you want to monitor. A straight-forward script system enables you to combine sensors to create your own alert conditions, which can include factors from any level of your system, combining application delivery speeds with network device performance, for example. You can buy WhatsUp Gold and its add-ons outright, or subscribe to the software annually. The company produces a Total Plus package, which is only available for sale and not for subscription. This pack includes all of the modules of the top WhatsUp Gold package plus the Application Performance Monitor and the Network Traffic Analysis, Virtualization Monitor, and Configuration Manager modules. You can read more about WhatsUp Gold in our review. WhatsUp Gold and its Application Performance Monitor module run on Windows Server and the demo version will also run on Windows Pro environments. You can get a 30-day free trial of the software to run it through its paces risk free. CA Technologies produces three separate packages for application performance monitoring. These are: Application Performance Monitoring, App Experience Analytics, and Synthetic Monitoring. Each of these modules is delivered on a SaaS model and charged by subscription. The company doesn’t offer a package of all three. The App Experience Analytics system covers user experience and would be a useful addition if you want to monitor a website. The Synthetic Monitoring module also focuses on user engagement and it models visitor transactions so you can analyze the performance of a website. The main APM product of CA, though is its Application Performance Management tool. This APM is aimed at large organizations and its main feature is the ability to promote teamwork. Its key perspective is the transaction tracer that builds up a map of application and service dependencies. The visibility of app dependencies extends to database performance. You will be able to see graphs of application delivery performance over time, which should help you spot anomalous behavior as well as peak demand and times with spare capacity. The baseline built by the monitor gets updated constantly, so it will be able to provide you with a better insight into the normal behavior of your apps as time progresses. If you employ containers for secure app delivery under BYOD policies, the APM can see into the delivery of those apps as well. The data collected by the system extends to host performance and application code analysis. The services of Cloud-based and remote hosts are also included in the APM’s line of sight. A higher Enterprise plan offers unlimited usage of the system. This service can be accessed on the Cloud or installed on premises. The Enterprise plan includes retention of data for 90 days to aid analysis. The Essentials package only gives you 7 days of data. You can get the system on a 30-day free trial, during which time all of your monitoring data is retained. AppEnsure monitors both user experience on a website and application delivery statistics to help you provide online services effectively. The alert conditions arise from poor performance as experienced by the user. You don’t need to wait for a complaint to come in from any of the visitors to your site because the AppEnsure monitor will detect the problem. In fact, you should be able to head off delivery impairment because the monitor will identify deterioration in service before it gets to the point where users of a site notice problems. Infrastructure monitoring will lead you to the cause of mounting problems and enable you to make adjustments to resources. The AppEnsure service is delivered online. When you begin with the service, AppEnsure software will search through your system for all end-user apps and then trace back to identify supporting apps and services. This discovery process results in a map, which amounts to an application stack. Once operational, AppEnsure records the performance of app delivery to every user. Initially, this data gathering allows the system to establish a baseline pattern of normal behavior. Once an acceptable level of delivery performance has been established, subsequent performance can be monitored for any anomalies or deterioration in response times that would indicate a problem in the system. As AppStack also monitors the application stack, it is able to draw your attention to the service that is the probable cause of application delivery problems; rather than just telling you that a user-facing application is possibly encountering trouble. The visibility of AppEnsure includes onsite and remote resources, plus Cloud-based services. The application stack monitoring extends to virtualized environments. It can trace the servers that support your virtual machines and identify status issues there. AppEnsure is particularly well integrated with the Citrix XenApp environment. The detection methods of AppEnsure will detect and track pre-written applications, such as Microsoft Exchange, Sharepoint, and ERP systems. It is also able to monitor your own custom-built applications. The AppEnsure service is charged for on a subscription basis. You can get a 14-day free trial of the system. Datadog offers Cloud-based monitoring for infrastructure, applications, and event logs. You can sign up just for the application performance monitor or use all three systems in combination to improve service visibility. All of these services are charged for by subscription and the price depends on the number of hosts that you operate. The system is able to monitor on-premises, cloud-based, and hybrid systems. There is a free version of the infrastructure monitor that will manage data from up to five hosts. You can’t get the APM for free perpetually, but you can get a 14-day free trial. Datadog monitors every request for an application and tracks its delivery, which involves examining events down the application stacks. Any anomalies that appear during the delivery of the application causes an alert trigger. Those alerts will accumulate, so you will instantly be able to see in the dashboard what application is in trouble and which service seems to be the cause of the problem. The dashboard is very attractive and integrates graphical data representation to ease status recognition. You will be able to switch views to focus on the end users that are experiencing the worst performance and zoom in on individual users to examine the problems that application delivery encounters in that session. You can customize the dashboard and even create different views to assign to individual team members. The system includes APIs, so you can even integrate elements of Datadog’s dashboard into your own corporate system monitoring pages. Interfacing between Help Desk software and Datadog reduces the need for support staff to switch between applications in order to tie in human error notification with automated alerts. You will get more assistance from the Datadog APM if you integrate it with the company’s Infrastructure package. The two packages are designed to share data, so the trace through application performance down to infrastructure statuses is seamless. No matter what type of business you have, application performance management is an important task of the IT department. In online businesses, the applications offered to visitors are the only contact that customers get with the organization, so guaranteed application performance is essential. For all other types of businesses, application performance is still a very important element of the IT system and heading off problems will keep the business running and reduce the number of Help Desk calls. You don’t want to rely on the system’s users to tell when the applications in your business are experiencing problems. If the service gets so bad that users notice, you have already failed in your job as an IT manager. Keep on top of your application performance with one of the tools on our list. Do you use an application performance monitor? Do you use one of the systems recommended in our list, or have you installed a different APM? Leave a message in the Comments section below and share your experience.